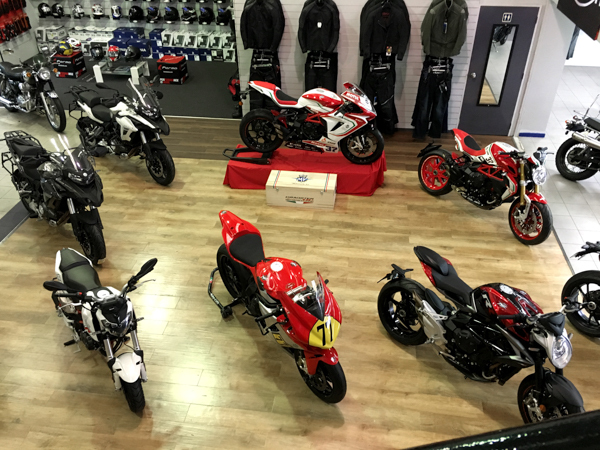 First European has welcomed an Italian racing legend into its Sydenham showroom and it offers all the luxury, speed and good looks one could expect from the Italians. With an illustrious past, MV Agusta first rose to prominence in the early twentieth century when it belonged to a pioneer of the fledgling aeronautics industry, count Giovanni Agusta. Agusta aircraft production soared during the First World War before the focus turned from aircraft to motorcycles post-World War II and a world champion was born. The glory years for MV Agusta were from 1948 when Franco Bertoni won the 125 cc in the Italian Grand Prix, to 1976 when Agusta retired from Grand Prix racing at the end of the 1976 season, having won 270 Grand Prix motorcycle races, 38 World Riders’ Championships and 37 World Constructors’ Championships. After a few years off the track, 2004 marked the company’s return to racing and to victory and every year has been a little bit better for this racing legend. MV Agusta has taken the bold step of adding the initials of the company’s racing department – Reparto Corse – and the move signifies the exceptional quality and styling which is directly derived from its efforts at the World Superbike Championship. There’s an exciting range of five Reparto Corse special edition models available from MV Agusta, from the high-end F3 RC supersport in both 675 and 800 versions, to the new special Brutale 800 RR Pirelli, the updated version of the rare and collectable Dragster 800 RC and the F3 800 has joined the gang. To find out more, visit First European at 114 Carlyle Street, Sydenham or phone 03-3662201.